Award-winning grower A C Goatham & Son has judged Ulma Packaging’s bespoke Atlanta tray-less flowrapper to be a resounding success and is investing in two more of the machines to meet increasing demands from customers for this style of packaging for fresh produce. Family-owned business A C Goatham supplies a huge range of apples to most of the big supermarket names, including its exclusive own brand and home-grown Zari® variety. To meet increasing demand for its products it is making a significant investment in a new packhouse and required the latest equipment to match this state-of-art packaging facility in Rochester, Kent. 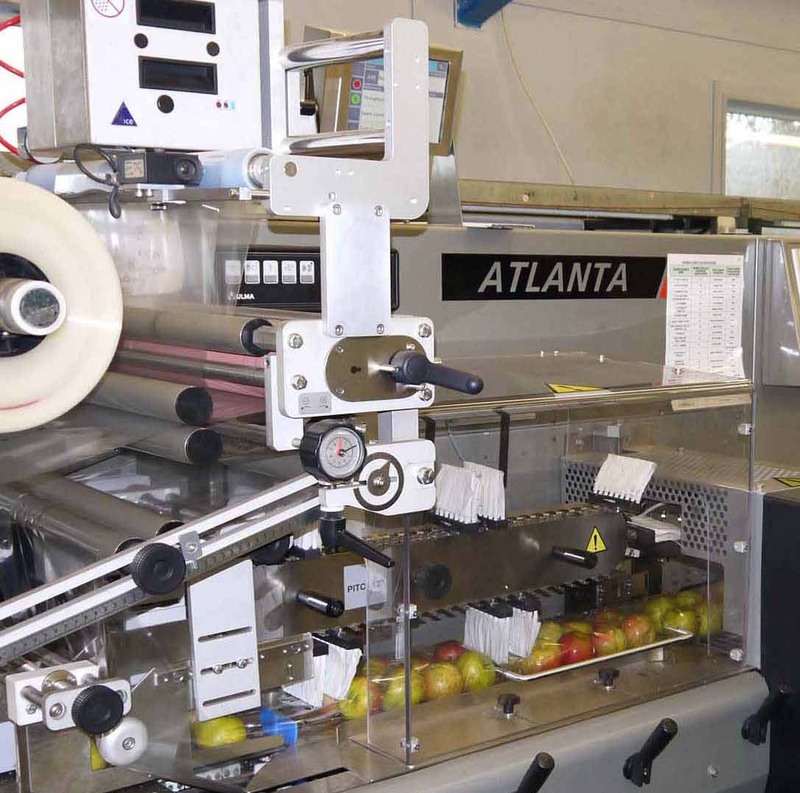 A C Goatham chose Ulma’s Atlanta packaging solution, which wraps apples in formats such as 2 x 2, 3 x 2, 4 x 2 and importantly 4 x 1 with or without trays all on the same machine, over a rival flowrapper because of the kit’s flexibility, robustness and cost-saving potential. Ulma’s ability to meet a strict seven-day deadline for the original machine to be on site and operating also convinced the grower to take two more flowrappers from Ulma, which will be installed at the new packhouse when finished to help cope with an estimated 27,000 tonnes of top fruit next season. Company partner, Ross Goatham, said: “We needed the machine in a hurry and it was a textbook installation. Ulma’s technical support is first class and they go the extra mile with rapid back-up when required. We’ve been very happy with the Ulma flowrapping equipment. It does exactly what we want. We are making a huge investment in a new pack house, but we can definitely see that by using flow wrap technology there are savings to be made. Ulma’s Atlanta tray-less flowrapper is offered in a variety of configurations based on apples arriving in cardboard boxes, pallet boxes/plastic crates or straight from the grading process. As another enhancement to the process, Ulma can also offer further line solutions with fully automatic crate packing and palletising. Over the next few weeks Ulma will be announcing an improved operator-less auto in-feed for the Atlanta wrapper in partnership with a leading European fruit handling machinery systems supplier. This will further enhance the offer with the reduction of operator intervention to feed the apples into the system. Suitable for large, medium and smaller fruit growers the system can be used for the tray-less packing of a cross-range of fresh produce, which will allow some producers to have the option of often using just one system for all their produce production as the system can also be configured to run with conventionally filled punnets from a de-nester. In addition to providing a fully flexible bespoke solution for apple packing, pre-printed roll stock film is used to make the bags, which can subsequently be labelled & coded immediately prior to flowrapping, this allows labelling to flat film – avoiding labelling to uneven or wrinkled surfaces after wrapping thus enhancing the pack appearance. The equipment is designed to produce a horizontally sealed bag using a series of bespoke features on the machine which enables the gentle wrapping of apples without any damage. From the moment the apples are placed in the machine care is taken at every point of contact to eliminate the risk of bruising – from the specifically designed soft in-feed through to the film application using a series of soft brushes to gently guide & separate the packs into the sealing jaws. Ulma has a long and impressive background in the fresh produce arena – its customer service is second to none according to Mr Goatham – and is an approved supplier to multiple retailers and others involved in the packaging of a cross-section of products including tomatoes, potatoes, onions, mangos, avocadoes, oranges, lemons and even kiwis.